Let me say before my review that I can not compare this film to the comics as I never read them. 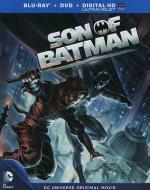 Matter of fact before seeing this film released I had no idea they ever did a storyline involving a Son of Batman. As for the film standing on it's own... I must say I enjoyed it very much! It has a good, strong storyline as well as a lot of action. Not to mention it's own fair share of bloodletting. I don't know how he compares to the comics... but I must say... I really like the character of Damian (Batman's son) and hope to see more animated films (even a live-action adaptation!) with him in it. If you are a fan of the animated superhero films this one is a must see! Well worth every minute! I'll probably get it eventually. I have liked the other animated comic movies I've seen. The DC ones have been pretty good.